Maintains pond all Year - even working at low Winter temperatures down to 4C. Visible results in a few days - treat once a Month for best results. Easy to use tablet form. The one step natural Pond Treatment for clearer and better water quality - for plants & fish! 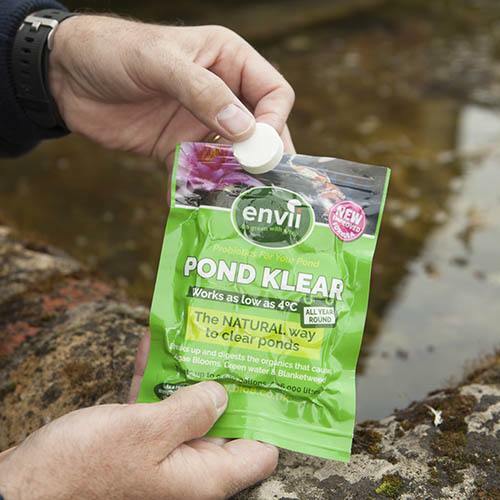 Envii Pond Klear digests organics and nutrients that cause green water, blanketweed & algae growth and maintains ponds all year-long - even working at low winter temperatures down to 4C. The tablets contain unique, patented strains of bacteria that work at low water temperatures and target the organics cause green water and algae blooms. Pond Klear binds suspended solids that cause cloudy water and sinks them to the bottom of the pond allowing the bacteria to breakdown and digest these organics. You’ll get visible results in just a few days. We recommend treating your pond once a month for best results. Supplied in an easy to use tablet form and as a pack of 12 tablets - 1 tablet treats 3,000L (800 gallons) once a month. and aeration running during treatment. 2. Remove any surface algae/debris where safe & practical. triple dose to regain balance/control. 4. BREAK/CRUMBLE tablet into bucket of pond water, stir and leave for a minimum of 2 hours. 5. Stir again, before distributing all over pond or near water feature to spread. For Ponds Without Filters – USE 2 TABLETS PER 800 GALLONS/3,000 LITRES.